Indie people have recently come to my attention as the “new hippie,” though you could never get away with calling them that to their face. 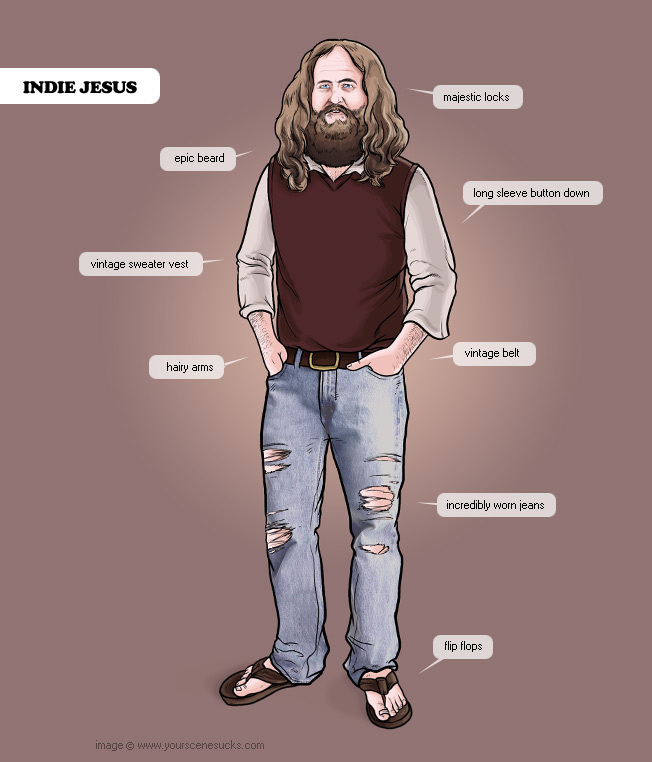 Well, along with the rest of Indie culture, we now have a savior for these mountain men, one who “doesn’t take no crap from the man.” While Indie Jesus may have kept his sacrosanct sandals and beard, he has been given a +1 Sweater Vest of Truth to replace his simple, white robes, and the addition of a vintage belt assures Him that He’ll be accepted at the next Pitchfork staff meeting. I wonder if He stays up nights listening to Bon Iver? Now all we need is Hipster Paul of Tarsus. Released in 2008, Dig, Lazurus, Dig!!! is the fourteenth studio album by the prolific Nick Cave and his backup band, The Bad Seeds. It ranked high on many ‘Best Of…’ lists of 2008 and solidified Cave’s place in the modern musical scene. The lyrics of this album are also complex, but in a very different way. While other prominent wordsmiths like Leonard Cohen pride themselves on their poetic influences, Cave seems to find the most joy by combining and juxtaposing the smooth with the gritty, the sec ular and the sacred. The timbre of the album is the most prominent juxtaposition on the album. It includes the basics of a rock group (vocals, guitar, bass, drums), but it also includes electronic sounds mixed with urban sound effects that give the impression of Mr. Cave singing to the cracked bricks of Hell’s Kitchen. The track “Night of the Lotus Eaters” displays Cave’s mythological influence by putting a modern edge on the ancient Roman myth of the Lotus Eaters, who appeared in The Odyssey and were said to eat the native lotus plants of their region. These plants are highly narcotic, and caused the people “to sleep in peaceful apathy” (http://en.wikipedia.org/wiki/Lotus-Eaters). Lines such as, “The dragons roam the shopping malls / I hear they’re gonna eat our guts” and “Get ready to shield yourself / From our catastrophic leaders” mix the ancient and modern into a socially relevant concoction. ﻿It’s surprisingly hard to find recordings of Cave’s work on YouTube. Someone needs to get on that.